Join in the fun when the Beach Party gang "dives" into trouble! I love the Beach Party movies. I do not love them ironically in a 'so bad they're good' way. I genuinely love them -- the energy, the music, the unabashed fun of them all. I recognize that many of them are not very good, particularly the later entries like Ghost in the Invisible Bikini or the otherwise-unrelated Ski Party (more a knock-off than an official entry). The series got loosier, sillier and, unfortunately, even dopier as it went along. That's saying a lot about a group of movies that were hardly Casablanca to begin with. 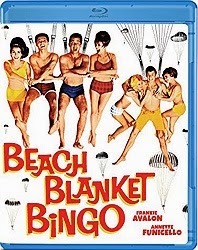 As the fifth Beach Party movie in only two years, 1965's Beach Blanket Bingo suffers from many of the same issues that plague the late-period efforts. It's broad. It's cartoonish. It is less a story than a series of scenes that hang together on the basis of some songs and the fact that all the scenes are set at the beach. I know these things and I love it anyway. I'm not a monster. You know the story by now. A group of kids go to live in a beach house for the summer. 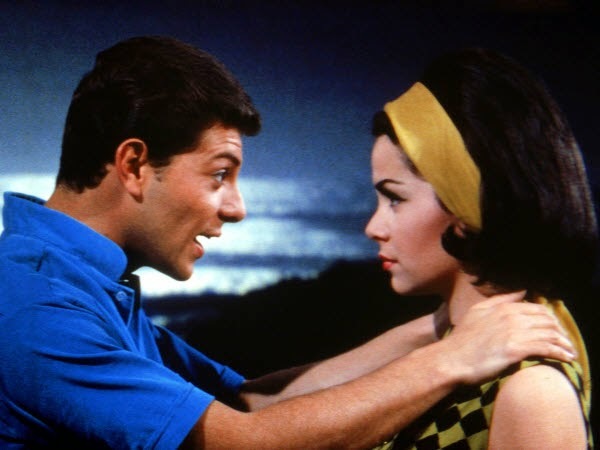 Two of them are Frankie (Avalon) and Annette (Funicello, here playing a character named Dee Dee). The main conflict this time out is the appearance of singer Sugar Kane (Linda Evans) and her opportunistic manager Bullets (Paul Lynde), who stages a phony drowning during which Frankie rescues Sugar. This makes Dee Dee jealous. Then Frankie is encouraged to take up skydiving at the insistence of Bonnie (Deborah Walley), who is using him to make her own boyfriend jealous. This compels Dee Dee to go diving as well, despite the fact that she hasn't the stomach for it. Oh, and Bonehead (formerly Deadhead, still played by Jody McCrea) falls in love with a mermaid (Marta Kristen) years before Splash. And Eric Von Zipper (Harvey Lembeck) is around, because of course he is. Buster Keaton shows up, too, mostly to look very old and sad and chase a bikini'd girl around to remind us all that even the greats will die someday. So, yes, it's ridiculous, and only gets more so as the movie introduces things like skydiving sequences comprised of mostly stock footage and mermaids and the villainous South Dakota Slim (Timothy Carey, best known to me as the heavy in The Monkees' Head) setting up a full on "Perils of Pauline" by tying up Sugar Kane and moving her on a belt towards a buzzsaw. It has all the realism and gravitas of a Scooby-Doo episode -- and all the guest stars, too. While I might prefer the more straightforward approach of the original Beach Party, it's not as though Beach Blanket Bingo has gotten the series so far off track. By the third film (1964's Bikini Beach) we were already getting super smart monkeys and Frankie Avalon in a dual role as both Frankie and British pop star/drag racer "Potato Bug." Throwing a mermaid into the mix just seems like the next logical step. So what is it I love about the movie? There are the surface things, like the music (in particular Donna Loren's "It Only Hurts When I Cry," "New Love" by Jackie Ward [singing for Linda Evans] and Frankie and Annette doing "I Think, You Think") and the '60s styles, for which I am a total mark. But I also love the sweet innocence of it all; these are movies about sexed-up kids but are content to let them dance and maybe -- maybe -- make out a little. Frankie and Annette are the world's oldest teenagers, and there's especially something I love about Funicello's sexlessness -- she's beautiful, but positively chaste. The movie is just months away from the total upheaval that would take place in the back half of the '60s: free love, Vietnam, cynicism and disillusionment. For better or worse, Beach Blanket Bingo represents a generation's last gasp of childlike innocence. As someone who has been clinging to my non-anamorphic DVDs of the these movies, I couldn't be happier that Olive Films is beginning to give them the HD treatment. Despite some scratches and age signs -- plus a constant variance in the brightness during one scene -- this is the best that Beach Blanket Bingo has ever looked. It should be noted that this is the same version of the film that appeared on the MGM DVD, meaning Annette Funicello's song "I'll Never Change Him" has been cut out. As that's not a change from every other version released on disc, I'm not bent out of shape about it even if it would have been nice to see it restored. Annette songs tend to be my favorite. I think it's the doubling of the vocal. If you've never seen a Beach Party movie, this is not the one to start you off. Better to go in chronological order and work your way towards the skydiving and the mermaids. This one is more for advanced studies. I love it just the same. How exciting (for me) that we live in a time in which these are finally getting upgraded to Blu-ray.